This post provides the training and documentation guide for the Summit’s church discipline process. It is the first post in a series designed to equip pastors/elders/churches to conduct church discipline with restorative excellence. 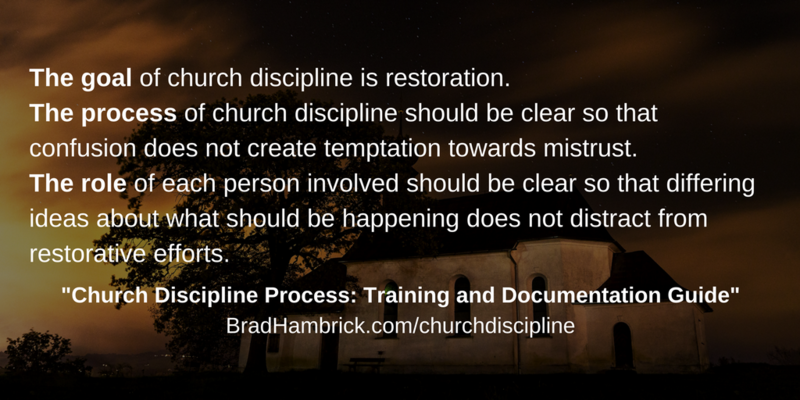 Church Discipline Process Presentation from The Summit Institute on Vimeo. The following steps are recommended for a church considering adopting this document as their church discipline guide. Read the document above in its entirety to familiarize yourself with it. Watch the video or listen to the podcast to better understand how it is designed and intended to be used. Revise the document to fit your church by-laws, polity, theology, and culture. Ask all church elders (lay and staff) who may oversee church discipline to read your revised edition of the process document and go through the training above. In order to better facilitate and equip pastors/elders/churches to conduct restorative church discipline with excellence, a series of resources are being developed to supplement this process document. Each of those supplements will be posted below. The “pre” and “post” designation is in reference to the formal conversations and structured process defined in the document above. How and When Does Church Discipline Begin? How and When Does Church Discipline Conclude? Why Is It Inappropriate (and Dangerous) to Alert an Alleged Offender of Abuse Before Calling CPS and/or the Police? What Is the “Becoming a Church that Cares Well for Abuse” Curriculum?